I appreciate the time you’ve taken to visit this site and find out more about Ritter Dental Centre, my team, and the many dental care services we can provide to help you achieve optimum oral health. 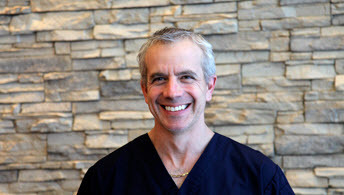 Born and Raised in Winnipeg, Dr. Alan Ritter completed his undergraduate degree from the University of Winnipeg before graduating from the Dental School at Northwestern University in Chicago in 1995. After getting married in 1996 Dr. Ritter accompanied his wife to San Diego and then to Phoenix while she pursued her graduate studies in Clinical Psychology. While living in the U.S. Dr. Ritter held various positions in a wide variety of settings including both suburban and inner city locations. Dr. Ritter and his family returned to Winnipeg in 2002 where he practiced for a year in Beausejour and then the following 7 years in the same Southdale/St. Vital location. In October of 2010 Dr. Ritter realized his long term goal by opening a new practice in a state of the art facility in the same area that allows him to continue to serve his existing patients as well as accommodating new ones. Dr. Ritter attended extensive continuing education courses with special interest in Endodontics (root canals), Lasers & esthetic Crown and Bridge restorative dentistry. Dr. Ritter currently lives in Winnipeg with his wife Jennifer and twin girls as well as his two humane society rescue dogs Mocha and Otis. In his off hours Dr. Ritter loves to participate in various recreational activities including working out, golf, hockey and all forms of water sports in the summer at the family cottage.